* Scratchbord is a premium quality scratchboard used for creating white on black and color scratchboard art for the fine artist. 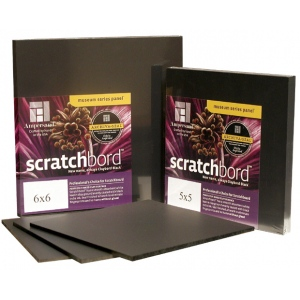 * It is an excellent alternative to traditional scratchboard paper. * Beginning with Claybord, we apply a beautiful even coating of India Ink over the panel. * With Scratchbord rigid backing, there are no wrinkled corners or threats of damage. * Also, once sealed, Scratchbord can be framed without glass! * It is pH neutral and acid free. * There are many tools that can be used to create a drawing on Scratchbord. * We have developed the finest tools and designed them for use on all of our Claybord products. * Also, if you need help getting started in scratchboard, we have a variety of kits, instructional books, and a DVD available. When beginning an artwork on Scratchbord, sketch in or transfer the drawing desired and lightly scratch in lines using a fine scratch knife. Some artists use a piece of chalk to cover the back of their drawing on paper that they want to transfer to the Scratchbord. After the back is chalked completely, they put they tape the drawing to the Scratchbord (chalk side down) and trace over the drawing with a pen. The chalk lines of the image are left on the panel and you can use your scratch knife to scratch your design into the panel. After the initial design is scratched in, you can use a soft cloth to remove the chalk leaving in place the drawing which will be ready to start scratching in the details. Note when transferring your drawing, it is important to scratch lightly so that it will be easy to change the area later if needed. Do not use a pencil to transfer your image. Erasing the pencil line can also erase the ink from the surface. Although Scratchbord is not completely repairable, we have a few suggestions on how to change areas you are unsatisfied with. To cover up lines, we recommend you use Ampersand Black Repair Ink sold in the Scratchbord ink set. This ink is a perfect match with the ink surface of Scratchbord and can be used to hide any unwanted scratches. Dilute the ink with a little water and apply it with a cotton swab or damp paper towel, the surface will come out more evenly matched with the rest of the board. If you have an airbrush, spray the area to correct the mistake with a diluted ink wash.
To create incredible color with scratchboard, begin by cleaning off all ink residue left from scratching with a soft brush or the palm of your hand. (Make sure your hand is very clean). Spray a workable fixative on the surface if desired. This will hold the black ink onto the board and keep it from mixing with the paint. Gouache, acrylics and colored India inks work well. The colors stay more vivid than watercolor. Sally Maxwell recommends using Kohinoor colored India inks. They are permanent, transparent colored inks that when applied, disappear over the black areas. The white areas receive the color and maintain bright vivid hues. Ron Ukrainetz uses acrylics to add color to his wildlife images done on Scratchbord. When finished with your piece, you1ll need to seal it with spray fixative like Krylon UV Resistant Clear Coating #1309 (Matte) or #1305 (Gloss). Before sealing the artwork, go over the piece with a soft brush to remove any clay dust. Spray it with 2 or 3 light coats of fixative and frame without glass. The fixative will remove fingerprints, smudges and any ink variations.